The molecular pathways underlying tumor suppression are incompletely understood. Here, we identify cooperative non-cell-autonomous functions of a single gene that together provide a novel mechanism of tumor suppression in basal keratinocytes of zebrafish embryos. A loss-of-function mutation in atp1b1a, encoding the beta subunit of a Na,K-ATPase pump, causes edema and epidermal malignancy. Strikingly, basal cell carcinogenesis only occurs when Atp1b1a function is compromised in both the overlying periderm (resulting in compromised epithelial polarity and adhesiveness) and in kidney and heart (resulting in hypotonic stress). Blockade of the ensuing PI3K-AKT-mTORC1-NFκB-MMP9 pathway activation in basal cells, as well as systemic isotonicity, prevents malignant transformation. Our results identify hypotonic stress as a (previously unrecognized) contributor to tumor development and establish a novel paradigm of tumor suppression. Cancer can develop when cells in the body gain mutations that allow them to grow and divide rapidly. Some of these mutations may affect the activity of genes that usually act to prevent cancer from developing. Several such “tumor suppressor” genes have been identified, but it is likely that many remain undiscovered and it is far from fully understoodhow all these genes work. One way to identify new tumor suppressor genes is to examine tumors to search for genes that have gained mutations that block their activity, known as loss-of-function mutations. Hatzold et al. identified a new and rather unexpected tumor suppressor gene by studying a zebrafish mutant that develops skin cancer as the embryo grows. The experiments showed that cells in the skin of the developing embryos of this mutant grow excessively and start to invade deeper tissues in the body. This behavior is caused by loss-of-function mutations in a gene called atp1b1a. This gene encodes part of an ion pump protein that helps to control the amount of water and ions in cells and in body fluids. Further experiments showed that this tumor suppressor gene does not act in the skin cells themselves but in other cells of organs such as the kidney. The kidney is involved in controlling the water and ion content of the body (known as osmoregulation), and the atp1b1a mutants have lower levels of ions and increased levels of water than normal zebrafish. Cancer formation could be completely blocked when the mutant embryos were kept in a solution that had the same salt and water content as the animals, instead of regular fresh water. This suggests that exposure of cells to body fluids with decreased ion and increased salt contents, a condition also called hypotonic stress, increases the risk of developing some tumors. Osmoregulatory organs that are not working efficiently, or injuries that expose cells to different ion and water levels can both cause hypotonic stress. The next steps are to investigate whether this stress also promotes cancer formation in mammals, including humans. Many malignancies result from loss-of-function mutations in one or more tumor suppressor genes whose normal function is concerned with the inhibition of cell division, the induction of apoptosis and/or the inhibition of metastasis. Most tumor suppressors affect one or more of these processes in a cell-autonomous manner, being produced by and acting within the tumor precursor cells themselves (Sherr, 2004; Sun and Yang, 2010), whereas comparably few genes are known to block tumorigenesis in a non-cell-autonomous manner (Chua et al., 2014). Tumor suppressors often act by inhibiting or antagonizing proto-oncogenic factors. The phosphatase PTEN for instance is the antagonist of phosphatidyl-inositol-3-kinases (PI3Ks), critical coordinators of intracellular signaling in response to extracellular stimuli such as growth factors and cytokines. Hyperactivity of PI3K signaling cascades, including that involving AKT/PKB (protein kinase B), is one of the most common events in human cancers (Altomare and Testa, 2005; Thorpe et al., 2015). One of the transcription factors regulated by PI3K/AKT via the mTORC1 complex is NFκB (Dan et al., 2008). Increased NFκB activity is observed in many carcinomas (solid malignancies derived from epithelial cells), promoting cell survival, proliferation and metastasis (Karin et al., 2002). However, the actual genetic cause of NFκB activation is unknown in most of these cases (Ben-Neriah and Karin, 2011). Furthermore, in other instances, anti-tumorigenic effects of NFκB have been described (Ben-Neriah and Karin, 2011). In epithelial cells, carcinogenesis can also be caused by compromised functioning of genes involved in the formation and maintenance of epithelial cell polarity (Martin-Belmonte and Perez-Moreno, 2012; Ellenbroek et al., 2012). Prominent examples of affected proteins include CRB3, a member of the Crumbs complex; PAR3, a member of the partitioning defective (PAR) / aPKC complex, which like the Crumbs complex promotes apical identities; and LGL1 (Lethal giant larvae-1), DLG (Discs large) and SCRIB, members of the Scribble complex, which promote basolateral identities. In Drosophila, a second pro-basolateral complex has been described, consisting of a Na,K-ATPase, Coracle, Yurt and Neurexin IV, which acts in partial functional redundancy with the Scribble complex (Paul et al., 2007; Laprise et al., 2009). Na,K-ATPases are ion pumps composed of a catalytic α-subunit and a regulatory β-subunit that is required for proper trafficking, localization, and functionality of the α-subunit (Geering, 2008). Four α-subunit and three β-subunit genes have been described in mammals, of which α1 and β1 are the major isoforms in epithelial cells. These subunits transport Na and K ions across the cell membrane, and thereby play well-characterized roles in generating electrochemical gradients in multiple cell types, and in sodium and water balancing in renal tubules, thereby regulating body fluid composition and volume. However, additional pump-independent and evolutionary conserved functions for Na,K-ATPase proteins have been described in the context of epithelial cell adhesiveness and polarity (Vagin et al., 2012). Here, the β-subunits play a prominent role. These are type II transmembrane proteins with glycosylated extracellular domains that can form β1-β1 trans-bonds between neighboring cells, thereby promoting both epithelial polarity and intercellular adhesiveness of cultured cells. β-subunit glycosylation has a positive impact on cell-cell adhesiveness, most likely by stabilizing E-cadherin cell adhesion proteins (Vagin et al., 2008). Consistently, in transformed Madin-Darby canine kidney epithelial cells (MDCK) cells, the expression of both E-cadherin and the Na,K-ATPase β1-subunit is drastically reduced, and epithelial polarity and junctional complexes can only be re-established upon repletion of both molecules (Rajasekaran et al., 2001). Na,K-ATPase β1-subunit levels are also reduced in cell lines derived from various carcinomas. This evidence, together with functional studies with transformed MDCK cells, has led to the proposal that the Na,K-ATPase β1 subunit has a potential tumor-suppressor function (Inge et al., 2008), but direct genetic evidence for this notion had been missing to date. Here, we report that a loss-of-function mutation in the β-subunit Atp1b1a causes epidermal malignancy in zebrafish psoriasis mutant embryos (Webb et al., 2008), correlated with reduced E-cadherin levels and a genetic interaction with the formerly described epithelial polarity regulator and tumor suppressor Lgl2 (Sonawane et al., 2005; Reischauer et al., 2009). During the affected stages, the epidermis is normally bi-layered, consisting of a tight junction-bearing outer periderm and a basal layer of keratinocytes. The latter are transformed in atp1b1a mutants, leading to their overgrowth and invasion of dermal compartments. Keratinocyte transformation is transduced via aberrant activation of a PI3K-AKT-mTORC1-NFκB-MMP9 (metalloprotease 9) pathway. Chemical inhibition of PI3K, mTORC1 and NFκB rescues all aspects of malignancy, whereas knockdown of MMP9 alleviates only epidermal invasiveness but not hyperplasia, pointing to a specific role of this matrix metalloprotease as one of the mediators of metastasis, and to the involvement of additional relevant NFκB targets. Epidermal malignancy is also fully suppressed upon incubation of embryos in isotonic (rather than the natural hypotonic) medium, and the remaining basal cell polarity and adhesiveness defects can be rescued by concomitant re-introduction of wild-type Atp1b1a in peridermal cells. Together with other presented data, these findings indicate that epidermal malignancy results from a combined loss of the β-subunit’s trans-layer function in promoting basal cell polarity via the periderm, and its osmoregulatory function in suppressing hypotonic stress. Possible tumor-promoting effects of hypotonicity during human carcinogenesis are discussed. The zebrafish psoriasis mutant was isolated in a phenotype-based screen after undirected ethyl methanesulfonate (EMS)-mutagenesis and has been described as developing edema as well as epidermal aggregates during embryogenesis (Figure 1a,b) (Webb et al., 2008). Aggregates were preferentially found on the median fin folds, but also on the flanks, the yolk sac and the head (Figure 1c–g). Analysis with specific molecular markers revealed that the aggregates consist of both peridermal cells and basal keratinocytes (see Figure 1h for schematic of embryonic skin), and can already be detected at 48 hours post-fertilization (hpf) (Figure 1i–k). Initial defects were more pronounced in the outer periderm, in which the normally flat cells started to round up (Figure 1i,j). In addition, cell membranes, in particular in basal domains facing the underlying basal keratinocytes, displayed reduced levels of the cell-cell adhesion molecule E-cadherin (Cdh1) (Figure 1i’,j’). Altered organization of basal keratinocytes themselves was only obvious in more advanced aggregates, in which cells had lost their regular epithelial shape and their mono-layered organization (Figure 1k). At 56 hpf, hyper-proliferation was evident in basal cells, whereas peridermal cells did not proliferate (Figure 1l,m). Epidermal aggregates in psoriasis mutants display hyperplasia. (a–g) Live images of wt siblings (a,c) and psoriasis mutants (b,d–g); psoriasis mutants develop pericardial edema (pe) and epidermal aggregates on the medium fin fold (b, d), on the yolk sac (e), on the flank (f) (all at 54 hpf), and on the head (g; 72 hpf). (h) Schematic of embryonic skin. Peridermal cells (PC, green) with apical tight junctions (TJ, red) are located above p63 basal keratinocytes (BC, red nuclei). The basement membrane (BM, red) separates the basal epidermal layer from the dermis containing collagen fibers (COL, green). (i–k) IF of periderm-specific GFP (green), Cdh1 (red), and p63 (red) on transverse sections through 48 hpf Tg(krt4:GFP) wt and psoriasis mutant embryos, counterstained with DAPI (blue). (i’–k’) show magnified views of regions framed in (i–k), without the green channel. In wt, the epidermis is bi-layered, with flat cells (i) and Cdh1 is localized at cell borders between peridermal and basal cells (i’; arrows). In an early-stage aggregate of the mutant, peridermal cells have rounded up (j), and Cdh1 levels are reduced at cell borders (j’,k’; arrows). An advanced aggregate (k) contains multi-layered basal epidermal cells (k’). Scale bar: 10 µm. (l,m) Whole mount IF of incorporated BrdU (red) and periderm-specific GFP (green) in 54 hpf Tg(krt4:GFP) wt sibling (l) and psoriasis mutant (m), showing elevated numbers of BrdU-positive non-peridermal cells in aggregates. (m) Maximum intensity projection of a confocal Z stack through aggregate; (m’) single focal plane. Scale bars: 20 µm. Abbreviations: BC, basal cell; BM, basement membrane; COL, collagen fibers; PC, peridermal cell; pe, pericardial edema; wt, wild-type. Live time-lapse imaging revealed partial epithelial-mesenchymal transitions (EMTs) in the basal keratinocytes of mutant embryos at 48 hpf, characterized by the formation of cellular processes and dynamic dissociations and re-associations of cells (Figure 2a,b and Videos 1,2). Transmission electron microscopy (TEM) and immunofluorescence (IF) analyses of the median fin folds of psoriasis mutants revealed that at 58 hpf basal keratinocytes had loosened their intercellular connections (Figure 2c,d). In addition, the basement membrane (BM) underneath the basal layer was disintegrated to variable degrees (Figure 2e–j; Figure 2—figure supplement1). Furthermore, numerous basal cells had entered the dermal compartment (Figure 2i,j) where they were in close contact with the remnants of the actinotrichia, dermal collagenous structures that were significantly disassembled in regions with epidermal aggregates (Figure 2c,d,g,h; Figure 2—figure supplement 1a–d). Together, this evidence demonstrates that basal keratinocytes of psoriasis mutants display both hyperplasia and invasive behavior, characteristics of epidermal malignancy. psoriasis keratinocytes display partial EMT and invasive behavior. (a,b) Stills from in vivo time-lapse recordings (Videos 1 and 2) of clones of membrane-bound GFP-labelled (Tg(Ola.Actb:Hsa.hras-egfp)) basal keratinocytes in a mosaic wt (a) or an atp1b1a morphant (b) embryo; 'n min' indicates elapsed time since the start of the recordings at 48 hpf (Videos 1 and 2). Wild-type cells form a rigid epithelium and maintain their shapes and relative positions (a), whereas atp1b1a morphant cells form cellular processes (arrows), dynamically dis- and re-associate (arrowheads) and eventually crawl on top of each other (cell 1; b, first panel). Cell 1 moves out of the focal plane after 60 min, cell 6 changes its shape from roundish to more hexagonal and vice versa. Scale bars: 20 µm. (c,d) Transverse TEM sections through median fin fold, at 58 hpf. In wt (c), an intact basement membrane (BM; black arrowhead) separates the compact layer of basal cells from the underlying dermis, which contains actinotrichia (small asterisks). The psoriasis mutant (d) displays large intercellular gaps (large asterisk) between basal cells, cellular protrusions (arrows) of basal cells, a discontinued BM (arrowheads to remaining BM), direct contacts between epidermal cells, and disassembling dermal actinotrichia (small asterisks) that lose their regular shape and striated pattern. bc: basal cells; pc: peridermal cell. Scale bars: 1 µm. (e,f) Laminin and peridermal-specific GFP double IF, counterstained with DAPI, at 58 hpf. Transverse sections through the fin fold of Tg(krt4:GFP) transgenics reveal basement membrane fragmentation (arrowhead) below an epidermal aggregate in the mutant (f). (g,h) Laminin and type II collagen double IF, counterstained with DAPI at 58 hpf; view of fin folds of whole mounts, showing basement membrane fragmentation and actinotrichia disassembly in the mutant (h). (i,j) Laminin and p63 double IF, counterstained with DAPI at 58 hpf; transverse section through the yolk sac. Arrowheads in (j) point to holes in the basement membrane of the mutant. Note the presence of p63 keratinocytes below the basement membrane in the dermal space. Scale bar: 20 µm. In vivo time-lapse recordings revealing stable epithelial integrity of basal keratinocytes in wild-type embryo. In vivo time-lapse recordings of mosaic wt embryo with clones of basal keratinocytes labeled with membrane-bound GFP. The Tg(Ola.Actb:Hsa.hras-egfp)-bearing progenitors of these clones had been transplanted into a non-labeled host at 6 hpf. At 48 hpf, the mosaic embryo was mounted in 1.5% low-melting agarose in E3 medium and z-stacks of clusters of GFP-positive cells were recorded every five minutes with a Zeiss laser scanning microscope (Zeiss LSM710 META) for 95 min. Maximum intensity projections were processed using ImageJ software. Stills of the Videos are shown in Figure 2a. Similar results were obtained for nine recordings from 9 different individuals. 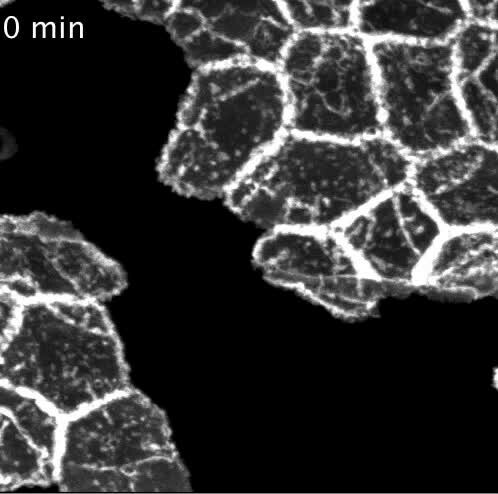 In vivo time-lapse recordings revealing partial EMT of basal keratinocytes in atp1b1a morphant embryo. In vivo time-lapse recordings of mosaic atp1b1a morphant embryo with clones of basal keratinocytes labeled with membrane-bound GFP. The Tg(Ola.Actb:Hsa.hras-egfp)-bearing progenitors of these clones had been transplanted into a non-labeled host at 6 hpf. At 48 hpf, the mosaic embryo was mounted in 1.5% low-melting agarose in E3 medium and z-stacks of clusters of GFP-positive cells were recorded every five minutes with a Zeiss laser scanning microscope (Zeiss LSM710 META) for 95 min. Maximum intensity projections were processed using ImageJ software. Stills of the videos are shown in Figure 2b. Similar results were obtained for nine recordings from 9 different individuals. In addition, psoriasis mutants displayed moderate skin inflammation, characterized by increased numbers of mpx-positive neutrophils and lyz-positive macrophages at 54 hpf (Figure 2—figure supplement 2a,c; and data not shown). This inflammation does not, however, seem to contribute to epidermal malignancy, as epidermal aggregates of unaltered numbers and sizes were also obtained in psoriasis mutants after ablation of the myeloid lineage by pu.1 antisense morpholino oligonucleotide (MO) injection (Carney et al., 2007) (Figure 2—figure supplement 2a–e). Applying meiotic mapping, Webb et al. had placed the psoriasis mutation within a defined region on LG 6, but the causing lesion had not been identified (Webb et al., 2008). We conducted whole exome sequencing of pooled mutant siblings and their (heterozygous) parents and confirmed the linkage to LG 6 (Figure 3a,b). In addition, we identified a C to T transition in exon 6 of the gene atp1b1a, which was confirmed by Sanger sequencing (Figure 3c). By contrast, exons of all other annotated genes in this region (from 1.32 Mb / 22 genes North to 1.43 Mb / 20 genes South of atp1b1a) contained no nonsense, non-conservative missense or splice site mutations (Figure 3—figure supplement 1). The psoriasis phenotype is caused by a loss-of-function mutation in atp1b1a, which is expressed in multiple epithelia, but not in basal keratinocytes. (a-d) Exome sequencing links the psoriasis mutation to LG6 and identifies a C to T transition in atp1b1a. (a,b) Heat maps showing the density of variant loci over the whole genome (a) and on chromosome 6 (b). The Y-axis shows the absolute value of the difference in the percentage of DNA harboring the variation between the pool of affected offspring and the pool of their parents. Most of the genome shows a difference close to 0%, indicating that the parental DNA segregated randomly in the affected offspring. Only one peak on chromosome 6 shows low density at a difference of 0%, but high density at between 25% and 50% difference, which is expected at the linked locus under the assumption of a recessive mode of inheritance. (c) Chromatographs of Sanger sequencing of sibling and mutant DNA showing the psoriasis mutation (*). (d) Schematic representation of the atp1b1a locus. Red arrowhead indicates the position of the mutation. (e) Live images of 54 hpf wt siblings, psoriasis mutants, and atp1b1a morphants. MO-based knockdown of atp1b1a in wt embryos phenocopies both the pericardial edema and epidermal aggregates. Scale bars: 500 µm; 250 µm (magnifications). (f–i) WISH detects atp1b1a RNA (blue) in heart and multiple epithelia of 48 hpf wt embryos, including the pronephric duct and the periderm but not in the basal keratinocytes (f–h), as seen at higher magnification after counterstaining of nuclei of basal keratinocytes for p63 protein (i). The atp1b1a RNA signal is not detected around p63 nuclei, but is detected in hexagonal peridermal cells with p63– nuclei. Abbreviations: h, heart; le, lense; oe, olfactory epithelium; ov, otic vesicle; pd, periderm; pfb, pectoral fin bud; pn, pronephros; pnd, pronephric duct. atp1b1a encodes a β-subunit of a Na,K-ATPase, an ion pump that drives the directional transport of Na and K ions across cell membranes. The functional pump consists of two subunits, the catalytically active α-subunit and the regulatory β-subunit, which is a type II transmembrane protein. The identified C to T transition (C760T) results in the generation of a premature stop codon (Q254*) (Figure 3d), removing the highly conserved C-terminus of the β-subunit’s extracellular domain. Upon knocking down atp1b1a in wild-type embryos with a previously described MO blocking atp1b1a translation (Blasiole et al., 2006), we obtained edema and epidermal phenotypes indistinguishable from those of the psoriasis mutants (Figure 3e). This indicates that the identified mutation is indeed the causative lesion and has a loss-of-function effect. To gain first insights into potential sites of essential Atp1b1a functions, we determined the β-subunit’s expression pattern in 24– 48 hpf wild-type embryos via whole mount in situ hybridization (WISH). Consistent with former reports (Thisse et al., 2001), atp1b1a was strongly expressed in the pronephros, the heart, and multiple (other) epithelia (Figure 3f,g). In addition, we found previously unrecognized expression in peridermal cells, but not in the basal keratinocytes of the epidermis (Figure 3h,i). The zebrafish Na,K-ATPase α-subunit Atp1a1a.1 has been formerly described as required for heart tube elongation and proper heart-beating (Cheng et al., 2003). psoriasis mutants also displayed a mildly reduced heartbeat rate at 33 hpf, which was more pronounced at 50 hpf (Figure 4c), but no defects in heart tube elongation were apparent at 34 hpf (Figure 4a,b). This suggests that atp1b1a is required for proper functioning of the embryonic heart rather than for its development, although the cellular basis of the heart malfunction in psoriasis mutants remains unclear. We could, however, identify specific defects in the organization of epithelial cells in the pronephros and its ducts. 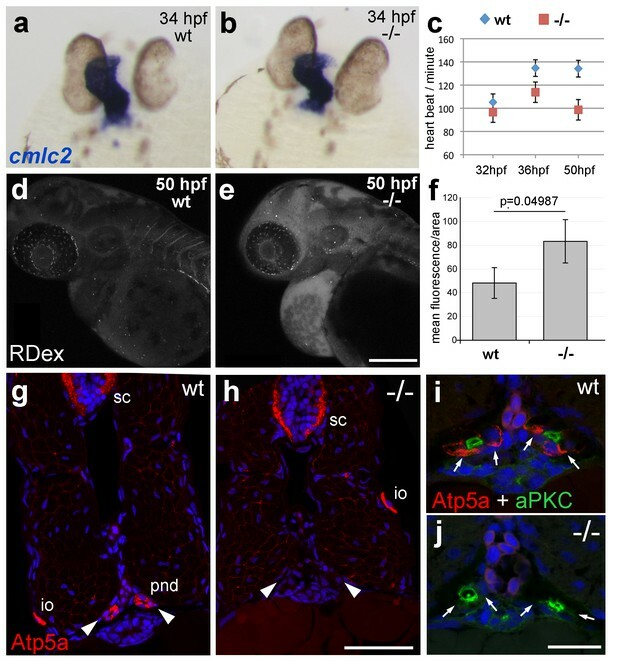 Antibodies raised against the chicken Na,K-ATPase α-subunits α5 and α6F have been reported to detect zebrafish α-isoforms in the embryonic kidney (Drummond et al., 1998) and in ionocytes (Lin et al., 2006) (but not in the heart and periderm; own data not shown). α5/α6F immunolabelling was completely absent in the pronephric duct of psoriasis mutants, but not in their ionocytes (Figure 4g–j), demonstrating that the mutation in the β-subunit results in a complete failure to target these α-subunits to the basolateral membrane of pronephric cells. 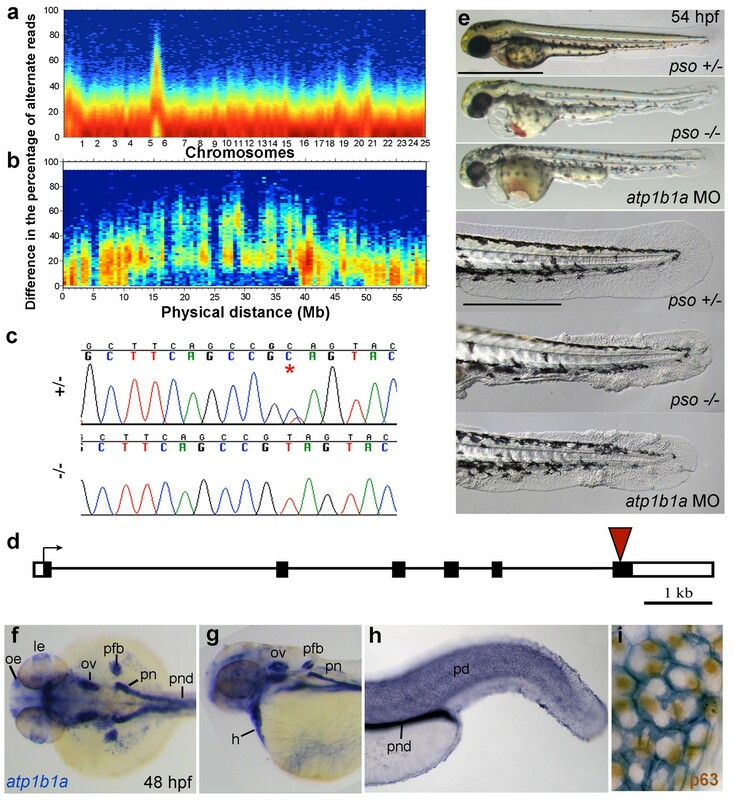 A comparable mislocalization of α-subunits in the zebrafish pronephros has been associated with compromised osmoregulatory function and edema formation in several other instances (Drummond et al., 1998; Hentschel et al., 2005; Martin-Belmonte and Perez-Moreno, 2012). atp1b1a is required for proper heart and pronephric function. (a, b) WISH of cmlc2 in 34 hpf embryos reveals normal heart tube elongation in psoriasis mutants. (c) psoriasis mutants exhibit a reduction of the heart beat. n = 12 (mutants), 24 (siblings). p values: 32 hpf: 3.8E-04, 36 hpf: 6.8E-07, 50 hpf: 1.2E-11. (d– f) psoriasis mutants show compromised clearance / excretion of rhodamine-dextrane injected into the cardinal vein at 34 hpf; confocal images of live embryos of wt sibling (e) and mutant (f) embryos at 50 hpf; RDex, rhodamine-dextrane; scale bar: 200 µm. (f) Quantification of mean fluorescence intensity of a defined area in confocal images, determined with ImageJ software; n = 3 for each condition. Error bars represent standard deviations. (g–j) IF of Atp5a (red) and aPKC (green), counterstained with DAPI (blue), on transverse sections of 54 hpf wt (g,i) and psoriasis mutant (h,j) embryos. Atp5a signal is absent from the pronephric duct (pnd, arrowheads) but not from ionocytes (io) or spinal cord (sc) in psoriasis mutants (g,h). The apical marker aPKC is still present in the pronephric duct cells of psoriasis mutants, outlining the lumen of the ducts, whereas Atp5a is missing from the basolateral site (arrows; i,j). Together, this evidence points to an essential role for Atp1b1a in the proper positioning of the Na/K pump in the basolateral membrane domain of kidney epithelial cells, which is crucial for the kidney’s osmoregulatory function. Together with the reduced heart beat, these kidney defects should lead to compromised renal water secretion. Indeed, clearance of rhodamin-dextrane injected into the cardinal vein was significantly reduced in psoriasis mutants at 24 hr post injection (Figure 4d–f). The osmoregulatory demands of an animal depend on its environmental conditions. Zebrafish live in freshwater and are estimated to have an internal osmolarity of 230–300 mOsm, whereas freshwater has 10 mOsms (Enyedi et al., 2013). As a consequence of this external hypotonicity, the embryos face a continuous passive influx of water that needs to be actively excreted via the pronephros. Therefore, compromised function of Atp1b1a in pronephros and heart causes edema formation as a result of increased water content, which is indicative of hypotonicity in interstitual compartments. To bypass the need for Atp1b1a for osmoregulation, we incubated psoriasis mutant embryos in E3 medium containing 250 mM mannitol, which is isotonic to the interior of the embryo (Enyedi et al., 2013). This treatment led to the expected abrogation of edema formation (Figure 5a–d). In addition and more surprisingly, it also completely rescued epidermal hyperplasia and aggregate formation (Figure 5a–k). Similar results were obtained by incubating mutant embryos in isotonic Ringer’s solution (Figure 5i). This indicates that deregulation of the osmotic state in psoriasis mutants results in epidermal hyperplasia, and that the osmoregulatory function of atp1b1a is required for proper epidermal homeostasis. Epidermal hyperplasia is dependent on hypotonic conditions. (a–k) psoriasis mutants raised in isotonic conditions do not develop epidermal hyperplasia. Live images of 60 hpf embryos (a–d) show epidermal aggregates and pericardial edema (pe) in the mutant raised in hypotonic E3 (b) but not in the mutant raised in isotonic E3 (d). 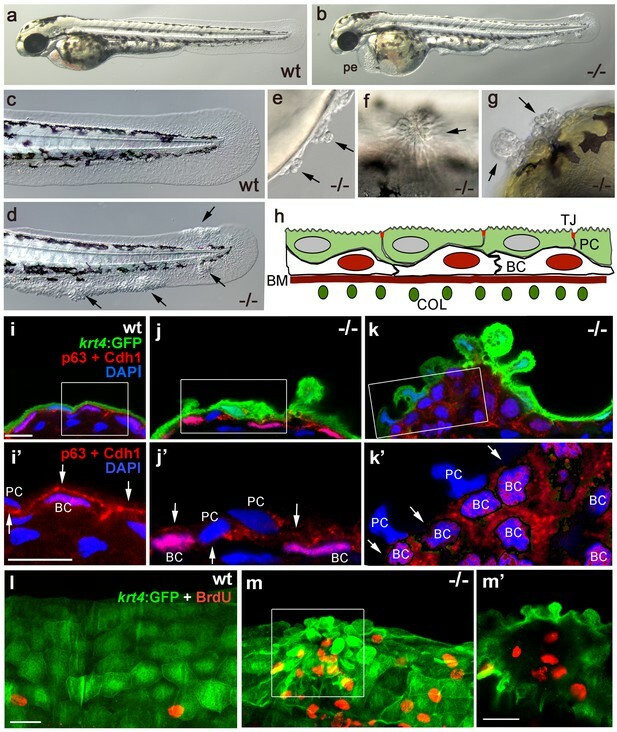 IF of BrdU incorporation (white) in 72 hpf wt or atp1b1a morphant tail fins (e–h) reveals excessive cell proliferation in the fin fold of the morphant embryo (f) raised in hypotonic E3 but not in the morphant embryo (h) raised in isotonic E3. (i) Quantification of embryos as shown in (a–d), obtained from incross of two psoriasis /- parents. n = 86–122. (j) Representative gel with PCR products subjected to MwoI restriction digest to genotype embryos raised in isotonic medium. All mutants raised in isotonic medium and shown as representative examples in this and the following figures had been positively genotyped. (k) Quantification of embryos as shown in (e–h), scored is the number of BrdU-positive cells in a given area of the median fin fold. n = 3–7 per condition. Error bars represent standard deviation. p values are as follows: a: 0.0416, b: 0.9139, c: 0.8956, d: 0.0017. (l–n) Live images of 56 hpf wt embryos (l,l’), psoriasis mutant embryos (m,m’), and wt embryos treated with 3mM ouabain (n,n’) starting from 33 hpf. Blockage of Na,K-ATPase pump function by ouabain results in pericardial edema (pe) as in psoriasis mutants (n = 122/125; compare n to m), but not in epidermal aggregates (n = 0/125; compare n’ to m’). But is the loss of this osmoregulatory function also sufficient to induce the epidermal defects? To test this, we incubated wild-type embryos in 3 mM ouabain, an inhibitor of the pumping function of the α-subunit. Treated embryos displayed numerous formerly reported phenotypes (Figure 5—figure supplement 1; and data not shown), typical of those caused by genetic mutations in other Na,K-ATPases (Blasiole et al., 2006), as well as pericardial edema (Figure 5l–n). These embryos did not, however, develop epidermal aggregates (Figure 5n’, compare to Figure 5m’), indicating that the loss of the osmoregulatory function of Atp1b1a is necessary but not sufficient for epidermal hyperplasia. This points to an additional, pump-independent function of Atp1b1a, which makes keratinocytes more resistant to hypotonic stress. Several functions additional to their role in ion homeostasis have been described for Na,K-ATPases, such as a role in epithelial polarity that promotes basolateral membrane identities, as well as a role in intercellular adhesion (see Introduction). To study the subcellular localization of zebrafish Atp1b1a, we transiently expressed an atp1b1a-gfp fusion construct in peridermal cells, one of its endogenous expression sites (Figure 3i), under the control of the krt4 promoter. As described for Na,K-ATPases in other epithelial cells, Atp1b1a-GFP was localized in the basolateral domain of peridermal cells, together with E-cadherin (Cdh1), while it was absent from the apical region marked by the tight junction protein Tjp1/ZO-1 (Kiener and Hunziker, 2007) (Figure 6a). Consistent basolateral defects were found in psoriasis mutants even when incubated in isotonic medium to exclude effects resulting from tonicity-related stress. TEM and IF studies revealed unaltered morphologies of tight junctions (Figure 6d,e) and an unaltered distribution of Tjp1 in the periderm of mutant embryos at 52 hpf (Figure 6—figure supplement 1). By contrast, the lateral regions of peridermal cells were less organized (Figure 6d,e), and aberrant gaps were observed between peridermal cells and underlying basal keratinocytes (Figure 6b–f), Furthermore, the membranous localization of Cdh1 and Lgl2 proteins was strongly diminished in both the peridermal and basal cells of psoriasis mutants, independent of whether they had been incubated in hypotonic or isotonic medium (Figure 7a–h). At later stages (84 hpf), basal keratinocytes of psoriasis mutants displayed a strong and tonicity-independent reduction in normally basally localized cytokeratins (Figure 7i–l), similar to that previously reported for lgl2 mutants (Sonawane et al., 2005). Together, this evidence points to a requirement for Atp1b1a for proper establishment of epithelial polarity and integrity, not only in the periderm but also in the basal layer. Atp1b1a is required for epidermal cell adhesion. (a) IF of GFP (a, green), Cdh1 (a’, red) and tight junction marker Tjp1 (a’’, magenta) on a transverse section of the epidermis of a 48 hpf wt embryo expressing peridermal-specific krt4:atp1b1a-gfp, counterstained with DAPI (blue; a’’’ with merged channels). Atp1b1a and Cdh1 are co-localized on the basolateral side of peridermal cells, but are excluded from tight junctions and the apical side of these cells. (b–f). Transverse TEM sections through the medium fin fold of wt and psoriasis mutant embryos raised in isotonic conditions, at 58 hpf. In the mutant epidermis (c,c’), aberrant gaps between peridermal cells (false-colored in green) and underlying keratinocytes (false-colored in red) are apparent when compared to the wt epidermis (b,b’). (d–f) Higher magnifications reveal tight junctions (indicated by arrows) of unaltered morphology in the mutant (e) compared to a wt sibling (d), but less organized lateral regions between peridermal cells (e), and large gaps (*) between peridermal and basal cells (e,f) in the mutant. bc, basal cell; pc, peridermal cell. Scale bars: 1 µm. Atp1b1a is required for epidermal integrity and polarity. (a–h). Whole mount IFs of Cdh1 (red) and Lgl2 (green) in 54 hpf embryos raised in hypotonic (a,b,e,f) and isotonic (c,d,g,h) conditions. In mutants, localization of Cdh1 (b, d, f, and h; compare to wt a, c, e, g) and Lgl2 (b’, d’, f’, and h’; compare to wt a’, c’, e’, g’) is compromised in both peridermal cells (a–d) and basal cells (e–h). Images show regions of the trunk epidermis not yet affected by aggregate formation. (i– l). Whole mount IFs of cytokeratin (red) in 84 hpf embryos show a reduction of basally localized cytokeratin in mutants raised in hypotonic (j) and isotonic (l) conditions. Images show regions of the trunk epidermis above the yolk sac extension. (m–p). Live images of the tail fins of 54 hpf embryos either with full MO knockdown of atp1b1a (m) or with partial MO knockdown of lgl2 (n), of atp1b1a (o), or of both (p). (q) Quantification of the phenotypes of 54 hpf embryos in synergistic enhancement studies; n = 31–88. Similar results were obtained in two additional independent experiments. In lgl2 mutants, the epidermal defects only become apparent comparably late (from 96 hpf onwards) (Reischauer et al., 2009; Sonawane et al., 2005), but a recent study uncovered a pro-basal effect of lgl2 on basal keratinocytes as early as 30–36 hpf (Westcot et al., 2015). This suggests that Atp1b1a might regulate epithelial polarity and epidermal integrity at least in part by cooperating with Lgl2 and by ensuring its proper localization. To test whether, in line with this notion, lgl2 and atp1b1a genetically interact, we performed synergistic enhancement studies. When either lgl2 or atp1b1a MOs were injected at a low, sub-phenotypic concentration, all embryos displayed wild-type morphology. By contrast, when the two MOs were co-injected at the same concentrations, 62% of the embryos (n = 74) developed pericardial edema, a loss of Na/K-ATPase α-subunits from the basolateral domains of pronephric epithelial cells, epidermal aggregates, and an upregulation of the malignancy markers pAKT and mmp9 in basal keratinocytes, similar to the phenotype after full knockdown of atp1b1a (Figure 7m–q; Figure 7—figure supplement 1). This indicates that lgl2 and atp1b1a cooperate to promote proper epithelial cell polarity and integrity in the epidermis as well as proper osmoregulation in the kidney, thereby suppressing epidermal malignancy. In contrast to lgl2 expression (Sonawane et al., 2005; Sonawane et al., 2009), atp1b1a expression in the epidermis is restricted to the periderm, suggesting that the effect of this gene on basal keratinocytes must be indirect. To prove this more directly, and to rule out indirect effects caused by hypotonicity, we analyzed chimeric embryos under isotonic conditions. Wild-type basal cell precursors that were transplanted into atp1b1a morphant hosts later exhibited distorted keratin distribution similar to that of their morphant neighbors (Figure 8a). Vice versa, atp1b1a morphant basal cells transplanted into wild-type hosts were indistinguishable from their wild-type neighbors and displayed normal keratin distribution (Figure 8b). This indicates that keratin localization in basal keratinocytes and the epithelial polarity of these cells are under the control of Atp1b1a function in a tissue other than the basal epidermal layer and the osmoregulatory organs. To show that this tissue is the periderm, we established a stable line of the aforementioned krt4 transgene driving expression of atp1b1a-gfp exclusively in peridermal cells. In psoriasis mutants carrying this transgene that were raised under isotonic conditions, keratin localization in basal keratinocytes was fully restored and indistinguishable from that in wild-type siblings (Figure 8c–e; n = 28/28; 3 independent experiments). 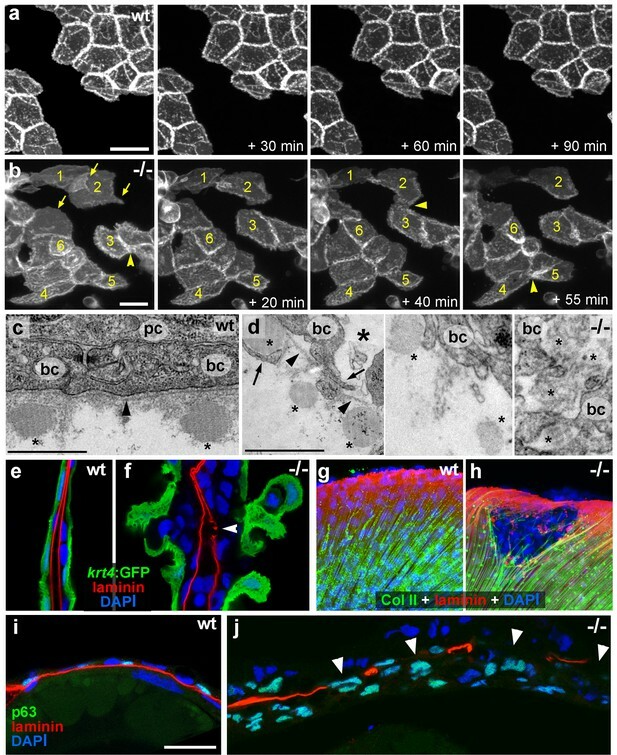 We conclude that atp1b1a is required in the periderm to establish proper epithelial polarity and organization in the underlying basal keratinocytes. Furthermore, this function is independent of the osmoregulatory role of Atp1b1a, as the corresponding defects are present even in mutants kept in isotonic medium, thus in the absence of hypotonic stress. When kept in hypotonic medium, psoriasis mutants carrying the krt4:atp1b1a-gfp transgene displayed a partial restoration of epidermal cell polarity both in the periderm and in the basal layer (cytokeratin and Lgl2 localization; Figure 8—figure supplement 1e,I,m and f,j,n) and a partial, but significant amelioration of basal cell malignancy (Figure 8—figure supplement 1a–c), including reduction in the expression of the malignancy markers pAKT and mmp9 (Figure 8f–h; Figure 8—figure supplement 1g,k,o). The failure of full restoration under hypotonic conditions suggests that hypotonic stress further challenges the epidermal polarity system, which becomes more difficult to repair than is the case under isotonic conditions. In addition, the data reveal that upon hypotonic stress, the degrees of epidermal polarity defects and epidermal malignancy are proportionally linked. atp1b1a is required in peridermal cells to establish epithelial organization of basal keratinocytes, and to suppress hypotonicity-induced upregulation of pAKT levels in basal keratinocytes. (a–b) IF of cytokeratins (Ker; red) and GFP (green) in 84 hpf chimeric embryos raised in isotonic conditions. Wild-type (wt) basal keratinocytes expressing Tg(Ola.Actb:Hsa.hras-egfp)-encoded membrane-tagged GFP transplanted into atp1b1a morphant hosts display reduced cytokeratin localization similar to that of host cells (a), whereas the cytokeratin distribution of morphant donor cells (green) in wt hosts is indistinguishable from that in neighboring wt cells (b). Images show regions of the trunk epidermis above the yolk sac extension. (c–e). Maximum intensity projections of confocal images of IF of cytokeratin (red) and periderm-specific Atp1b1a-GFP (green) in 84 hpf embryos obtained from an in-cross of psoriasis +/- ; Tg(krt4:atp1b1a-gfp) parents, raised in isotonic conditions. Embryos were genotyped after imaging. Cytokeratin localization in basal keratinocytes is distorted in non-transgenic psoriasis-/- embryos (d; compare to wt in c), but restored in psoriasis-/- ; Tg(krt4:atp1b1a-gfp) embryos (e). Images show regions of the trunk epidermis above the yolk sac extension. (f–k) pAKT IF (red) in 54 hpf embryos. pAkt is upregulated in psoriasis mutants raised in hypotonic (g) but not in isotonic (j) medium, compared to wt siblings (f, i). pAkt levels are ameliorated in psoriasis-/- ; Tg(krt4:atp1b1a-gfp) embryos kept in hypotonic medium (h). pAkt is not upregulated in wt embryos incubated in hypotonic medium after addition of 3 mM ouabain, starting from 33 hpf (k). Images show regions of the trunk epidermis not yet affected by aggregate formation. Abbreviation: iso, isotonic medium (E3 250 mM mannitol). We next explored the molecular pathways mediating the malignant transformation within basal keratinocytes of psoriasis mutants. In cultured human keratinocytes, hypotonic culturing conditions induce, among other effects, the phosphorylation and activation of the kinase AKT/PKB (Kippenberger et al., 2005), while a PI3K-AKT-NFκB-MMP9 (metalloprotease 9) pathway has been implicated with cellular invasiveness (Dilly et al., 2013; Wang et al., 2011). Furthermore, AKT has been shown to activate NFκB via mTORC1 (a mechanistic target of rapamycin complex 1) (Dan et al., 2008). psoriasis mutants that were raised in hypotonic conditions displayed strongly increased pAKT levels in both peridermal and basal cells, whereas wild-type siblings showed very little pAKT staining (Figure 8f,g). By contrast, pAKT levels were not elevated in atp1b1a mutants raised in isotonic medium (Figure 8i,j) or in wild-type embryos treated with ouabain (Figure 8k). Together, this evidence indicates that the pAKT pathway is only activated by hypotonic stress in conjunction with the epithelial polarity / adhesiveness defects caused by the loss of Atp1b1a function in the periderm. To investigate the functional involvement of PI3K, mTORC1 and NFκB in malignant basal cell transformation of psoriasis mutants, we blocked them with the PI3K inhibitors Wortmannin, PIK90 or LY294002, the mTORC1 inhibitors Rapamycin or AZD8055, and the NFκB inhibitor Withaferin A. We determined the effects of these drugs on epidermal aggregate and edema formation, epidermal polarity (cytokeratin localization), pAKT levels, pS6RP levels (as a readout of mTORC1 activity) (Hoesel and Schmid, 2013), NFκB activity (transgenic NFκB responder line; Candel et al., 2014), expression levels of mmp9 (which in mammals is a direct transcriptional NFκB target (Rhee et al., 2007) implicated in invasiveness), and finally epidermal proliferation. In addition to distorted keratin distribution (Figure 9f,f’) and increased pAKT levels (Figure 9g,g’) and proliferation rates (Figure 9k,k`) as described above (Figures 5,7,8), basal keratinocytes of atp1b1a mutants and morphants displayed strongly upregulated pS6RP levels (Figure 9h,h’), NFκB activity (Figure 9i,i’) and mmp9 expression (Figure 9j,j’). Upon treatment with any of the inhibitors, mutants continued to display edema (Figure 9a–e) and distorted keratin distribution in basal keratinocytes (Figure 9f’’–f’’’’), but they lacked epidermal aggregates (Figure 9a–e) and displayed mmp9 expression levels (Figure 9j’’–j’’’’) and keratinocyte proliferation rates (Figure 9k’’–k’’’’) that were back to wild-type levels. Hyperplasia and transcriptional upregulation of mmp9 in basal keratinocytes of psoriasis mutants is mediated via an aberrant activation of a linear PI3K-Akt-mTorC1-NFκB pathway. (a–e) Blockade of PI3K, mTorC1, and NFκB signaling rescues epidermal aggregate but not pericardial edema formation in psoriasis mutants. (a–d) Representative live images of phenotypic strength classes of psoriasis -/- embryos at 54 hpf, all with pericardial edema of comparable strengths, but strong (a), intermediate (b), weak (c), or no (d) epidermal aggregates. (e) Quantification of the phenotypes of psoriasis mutants incubated in E3 medium containing 1 µM Wortmannin, 5 µM PIK90, 25 µM LY94002, 1.1 µM Rapamycin, 30 µM AZD8055, or 30 µM Withaferin A compared to the corresponding DMSO controls (n = 16–30). Drugs were added at 34 hpf and embryos scored at 54 hpf. Similar results were obtained in at least two additional independent experiments. For representative live images, see Figure 9—figure supplement 1. f–k. A linear PI3K-Akt-mTORC1-NFκB pathway mediates hyperplasia and upregulation of mmp9 expression in basal keratinocytes. All embryos had been kept in (hypotonic) E3 medium, supplemented with the indicated drugs starting at 34 hpf. (f-–f’’’’) IF of cytokeratins (red) at 84 hpf. Distorted keratin localization in the psoriasis mutant (f’, compare to wt (f)) is not restored by Wortmannin (f’’), Rapamycin (f’’’), or Withaferin A (f’’’’). Scale bar: 50 µm. (g–g’’’’) IF of pAkt (red), counterstained with DAPI (blue); transverse sections of 54 hpf psoriasis mutants raised in E3 medium. Elevated pAkt levels in the mutant (g’, compared to the wt (g)) are lowered by Wortmannin (g’’), but not by Rapamycin (g’’’) or Withaferin A (g’’’’). Scale bar: 20 µm. (h–h’’’’) IF of pS6RP and p63 of whole mounts, at 54 hpf. Elevated pS6RP levels in mutant (h’, compared to wt (h)) are alleviated by Wortmannin (h’’), PIK90 (not shown) and Rapamycin (h’’’), but not by Withaferin A (h’’’’). Scale bar: 20 µm. (i– i’’’’) Confocal images of GFP fluorescence in the tail fin of a live 48 hpf wt embryo (i) and an atp1b1a morphant (i’), both carrying the Tg(NFκB-RE:eGFP) transgene. The atp1b1a morphant shows strong upregulation of NFκB activity in keratinocytes, which is restored by treatment with Wortmannin (i’’), Rapamycin (i’’’), and Withaferin A (i’’’’). Scale bar: 100 µm. For quantification, see Figure 9—figure supplement 2. (j–j’’’’) mmp9 WISH at 54 hpf. Elevated mmp9 expression in the mutant epidermis (j’, compare to wt (j)) is downregulated by Wortmannin (j’’), Rapamycin (j’’’), and Withaferin A (j’’’’). Scale bar: 50 µm. (k–k’’’’) IF of incorporated BrdU (red), counterstained with DAPI (blue) at 56 hpf. Elevated cell proliferation in mutant epidermis (k’, compare to wt (k)) is downregulated by Wortmannin (k’’), Rapamycin (k’’’), and Withaferin A (k’’’’). Scale bar: 100 µm. In addition, PI3K inhibition led to a downregulation and normalization of pAKT, pS6RP and NFκB activity levels (Figure 9g’’,h’’,i’’), whereas the mTORC1 inhibitor affected the pS6RP and NFκB but not the pAKT levels (Figure 9g’’’,h’’’,i’’’), and the NFκB inhibitor the NFκB but not the pS6RP and pAKT levels (Figure 9g’’’’,h’’’’,i’’’’). Together, this evidence points to the involvement of a linear PI3K-Akt-mTorC1-NFκB pathway in mediating epidermal malignancy downstream of the epidermal polarity and hypotonicity defects. A normalization of epidermal hyperplasia to that described above was also obtained upon blockage of cell proliferation by incubating mutant embryos in 50 mM hydroxyurea; by contrast, edema (Figure 10e; Figure 10—figure supplement 1a,b), compromised cytokeratin localization and increased pAKT, NFκB activity and mmp9 expression levels persisted (Figure 10a–d; Figure 10—figure supplement 1c; and data not shown). By contrast, mmp9 knockdown via MO injection failed to rescue epidermal hyperplasia (Figure 10e), but alleviated epidermal invasiveness. Thus, the degradation of the skin basement membrane was significantly, but not fully, blocked in mmp9-MO-injected psoriasis mutant embryos (Figure 10f,g, Figure 10—figure supplement 2). In addition, basal keratinocytes remained within the epidermal compartment (Figure 10h), in contrast to their ectopic localization in dermal compartments of mutant controls (Figure 1j). This indicates that Mmp9 is an essential downstream effector of the PI3K-AKT-NFκB pathway and is primarily involved in mediating epidermal invasiveness, whereas epidermal hyperplasia is mediated by other NFκB targets. Blockage of cell proliferation results in the normalization of epidermal hyperplasia, whereas blockage of Mmp9 activity reduces epidermal invasiveness in psoriasis mutants. 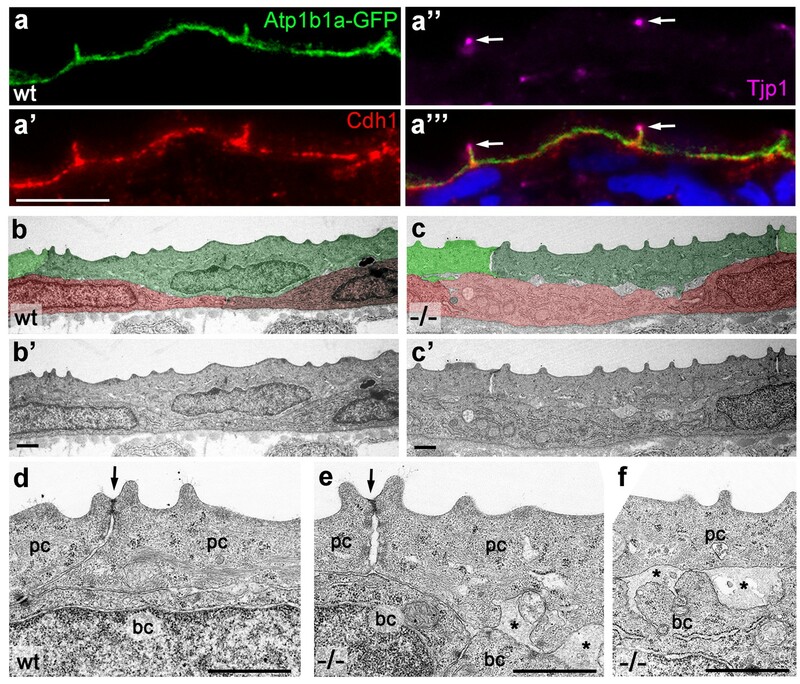 (a–b).Confocal images of GFP in the tail fin of live 48 hpf atp1b1a morphant Tg(NFκB-RE:eGFP) transgenics, showing that elevated NFκB activity in atp1b1a morphants (a) is not reduced by hydroxyurea treatment (b). For quantification, see Figure 10—figure supplement 1. (c–d) mmp9 WISH of 54 hpf psoriasis mutants raised in hypotonic E3. Elevated mmp9 expression in mutant epidermis (c) is not reduced by hydroxyurea (HU) treatment (d). (e) Quantification of the phenotypes of psoriasis mutants, either treated with 50 mM hydroxyurea or injected with mmp9 MO, compared to their respective siblings. e, pericardial edema; wa, weak epidermal aggregates; ma, medium epidermal aggregates; sa, strong epidermal aggregates . n = 17–47. Similar results for each condition were obtained in two additional independent experiments. (f–g) mmp9 knockdown alleviates basement membrane fragmentation. Laminin IF, counterstained with DAPI, in psoriasis mutants at 58 hpf, epidermal aggregates of comparable sizes. In the un-injected psoriaris mutant (f), the aggregate is associated with BM fragmentation, while the underlying BM is largely intact in the psoriasis mutant injected with mmp9 MO (g). For more images and numbers, see Figure 10—figure supplement 2. (h) mmp9 knockdown alleviates epidermal invasiveness. Laminin and p63 IF of transverse sections, counterstained with DAPI, through the yolk sac of a psoriasis mutant (58 hpf) injected with mmp9 MO. The basement membrane is largely intact (arrowhead to small remaining region with thinner basement membrane), and p63 keratinocytes are confined to the epidermal compartment above the basement membrane. For un-injected mutant and wt controls, see Figure 2i,j. (i) Diagram of the identified pathway in which the two required non-cell-autonomous effects caused by loss of Atp1b1a in periderm and osmoregulatory organs converge in basal cells. The pathway subsequently diverges downstream of NFκB to mediate overgrowth versus invasiveness of transformed keratinocytes. Question marks indicate components that have not yet been identified. For details, see text. atp1b1a is expressed in multiple organs and epithelia, including the periderm of the epidermis, the tubules / ducts of the pronephros and the heart (Figure 3). Accordingly, atp1b1a mutant embryos display compromised heart function (Figure 4), consistent with results reported in mouse (Barwe et al., 2009). In addition, they display a loss of the α-subunit of the Na/K-ATPase, the actual pump, from the basolateral domains of pronephric epithelial cells (Figure 4), possibly reflecting more general defects in the cells’ epithelial polarity and severely compromising the kidney’s osmoregulatory function. Together with the reduction in the blood pressure, these defects should lead to compromised water elimination in the pronephros, as reflected by the reduced clearance of rhodamin-dextran from the blood (Figure 4). The resulting increase in water content in turn causes edema formation and a corresponding reduction in the osmolarity of interstitial compartments (Drummond et al., 1998; Hentschel et al., 2005). In addition, and independently of its osmoregulatory functions, Atp1b1a is required in the periderm to assure proper epithelial polarity and cell-cell adhesiveness, both in the periderm and in the underlying basal keratinocytes. Thus, even when the osmoregulatory role of Atp1b1a has become dispensable upon incubation in isotonic medium, peridermal cells of mutant embryos display reduced levels of E-cadherin and of Lgl2, a pro-basal polarity regulator, as well as increased spacing between epidermal cells. Strikingly, basal keratinocytes themselves also display specific defects, such as reduced membraneous Lgl2 and E-cadherin levels, as well as a mislocalization of cytokeratins in basal domains. These defects could be rescued when transgene-encoded wild-type Atp1b1a was re-introduced into peridermal cells, indicating that Atp1b1a from the periderm regulates the epithelial organization and adhesiveness of basal keratinocytes in a tonicity-independent manner (Figure 8). But what are the molecular mechanisms that underlie this trans-layer effect? Trans-bonds between ATPase β-subunits, previously reported to mediate cell-cell adhesiveness in other instances (Vagin et al., 2012), could account for the adhesiveness among peridermal cells, but not for that between peridermal and basal cells, as the latter lack atp1b1a expression. The cell-cell adhesion molecule E-cadherin might be the relevant mediator. In psoriasis mutants, E-cadherin membrane localization is severely diminished both in peridermal and in basal cells (Figure 7). The reduction of E-cadherin in peridermal cells could be a direct consequence of the loss of Atp1b1a, with which it is normally co-localized in basolateral regions (Figure 6). This is consistent with the formerly reported physical interaction between ATPase α-subunits and E-cadherin via the anchoring protein ankyrin and the spectrin-actin cytoskeleton (Vagin et al., 2012). In addition, Atp1b1a could promote E-cadherin localization via other epithelial polarity regulators, consistent with reports in MCDK cells (Qin et al., 2005). We propose that it is this loss of proper E-cadherin in peridermal cells that compromises not only their adhesion to the underlying basal cells (due to the loss of trans-bonds between the basal side of peridermal and the apical side of basal cells; Figure 1) but also the adhesion among basal cells themselves, as well as their epithelial polarity. Consistent with the latter notion, loss of E-cadherin has been shown to affect apical-basal polarity in numerous systems (Desai et al., 2009; Stephenson et al., 2010). E-cadherin and epithelial polarity regulators, including Lgl2, are well-known tumor suppressors (Birchmeier, 1995; Martin-Belmonte and Perez-Moreno, 2012; Ellenbroek et al., 2012). Atp1b1a is another cell adhesion molecule and epithelial polarity regulator to add to the list,, as its loss causes crucial features of carcinogenesis (hyperplasia and infiltration of other tissues) in vivo. Strikingly, however, epidermal malignancy only occurs upon the combined loss of Atp1b1a’s osmoregulatory and epithelial polarity-regulating functions. Thus, hypotonic stress per se does not lead to basal cell malignancy, as demonstrated in this work by the treatment of wild-type embryos with ouabain. Consistently, none of the described kidney mutants, although displaying massive edema formation as a result of internal hypotonicity, have had reported skin defects (Drummond et al., 1998; Drummond, 2002; Hentschel et al., 2005). Moreover, epidermal malignancy in atp1b1a mutants is suppressed in the absence of hypotonic stress, although epithelial polarity and adhesiveness in the embryonic skin remain compromised. Carcinogenesis is commonly regarded as a multistep process, to which aberrant polarity signaling can contribute as one of multiple causative factors (Sherr, 2004; Sun and Yang, 2010; Ellenbroek et al., 2012). In this light, carcinogenesis subsequent to the combined loss of different functions of one and the same factor is an astonishing and thus far unrecognized variation of this common concept. In addition, it is remarkable that one of these genetically caused effects (hypotonicity) can also be achieved by environmental insults (injury), constituting an interesting variation of the common concept of tumorigenesis as a result of combined genetic and environmental factors. Another epithelial polarity regulator that has a tumor-suppressing function in the epidermis of zebrafish embryos is Lgl2. Like atp1b1a mutants, lgl2 mutants display aberrant apical-basal polarity of basal keratinocytes (mislocalized cytokeratin) and E-cadherin displacement, as well as epidermal hyperplasia and increased expression of mmp9 (Sonawane et al., 2005; Reischauer et al., 2009), which we now can interpret as a sign of invasiveness. Although not yet addressed, carcinogenesis in lgl2 mutants might also involve hypotonic stress, and lgl2, like atp1b1a, might act both in the epidermis and in the kidney. Thus, we found that atp1b1a and lgl2 not only genetically interact during epidermal cell polarity and malignancy but also during edema formation and Na/K-ATPase α-subunit localization (Figure 7—figure supplement 1), in line with previous reports of pronephric defects and mild edema formation in lgl2 morphants (Tay et al., 2013). However, atp1b1a and lgl2 mutants also display differences. Although in conjunction with other mutations, loss of Lgl2 function leads to defects in earlier developmental stages (Westcot et al., 2015; this work), epidermal hyperplasia in lgl2 single mutants begins significantly later (4 days post fertilization; dpf) than that in atp1b1a mutants (2 dpf). An even more pronounced requirement in different time windows has been reported for Na,K-ATPase and Lgl during epithelial polarity regulation in Drosophila embryos. Thus, defects in lgl mutants are manifested during gastrulation, when ATPase is dispensable, whereas corresponding defects in ATPase mutants are first detected during early organogenesis stages, when the defects in lgl mutants begin to recover (Laprise et al., 2009; Laprise and Tepass, 2011). This suggests that as in flies, Atp1b1a and Lgl2 in zebrafish might act in different basolateral-promoting complexes, which have differential temporal but partially redundant functions. In addition, although eventually converging at similar or even identical (mmp9) effector genes, Atp1b1a and Lgl2 can fulfill their tumor-suppressing role by blocking different pathways. Lgl2 has been reported to act by blocking ErbB and MAPK in later epidermal malignancies (Reischauer et al., 2009), but earlier it cooperates with Atp1b1a to inhibit aberrant activation of a PI3K-AKT-mTORC1-NFκB pathway (this work). Of note, chemical inhibition of the PI3K-AKT-mTORC1-NFκB pathway in atp1b1a mutants blocks epidermal malignancy, but it does not rescue the edema or epithelial polarity phenotype. This indicates that the pathway acts downstream of, and integrates, these two primary effects caused by the loss of Atp1b1a, which per se are necessary but not sufficient for pathway activation (Figure 10m). Parts of the PI3K-AKT-mTORC1-NFκB pathway had previously been reported to mediate hypotonic stress or tumorigenesis in other contexts. Thus, hypotonic stress induces the activation of the EGF receptor (EGFR), AKT and several MAP kinases (ERK1/2, p38) in cultured human keratinocytes (Kippenberger et al., 2005), in line with our observed increase in pAKT levels (but not in pERK levels; JH and MH, unpublished data). Furthermore, PI3K, AKT and NFκB mediate the tumorigenic effects of different cytokines in cultured prostate, gastric and leukemic cancer cells (Dilly et al., 2013; Kang et al., 2011; Wang et al., 2011), while mTORC1 controls NFκB activity downstream of pAKT in prostate and breast cancer cells (Dan et al., 2008; Davis et al., 2014). The effects of the transcription factor NFκB in the context of tumorigenesis are complex, and multiple mechanisms and effectors have been described. NFκB can affect cancer cell survival, proliferation and invasiveness, and can act in cancer cells themselves or on the tumor microenvironment, for instance by regulating tissue inflammation, which in turn further stimulates tumor progression (Ben-Neriah and Karin, 2011; Hoesel and Schmid, 2013). In atp1b1a mutants, however, inflammation seems to be of minor relevance: epidermal aggregates only display moderately increased numbers of innate immune cells, and genetic ablation of the entire myeloid lineage does not alleviate epidermal malignancy (Figure 2—figure supplement 2). One prominent direct transcriptional target of NFκB is mmp9 (Rhee et al., 2007), a matrix-metalloprotease with collagenase activity that destabilizes basement membranes and connective tissue, thereby facilitating tumor progression and metastasis (Kessenbrock and Werb, 2010; Kang et al., 2011; Dilly et al., 2013). In addition, MMPs can promote tumor vascularization and inflammation as well as tumor cell proliferation (Kessenbrock and Werb, 2010). 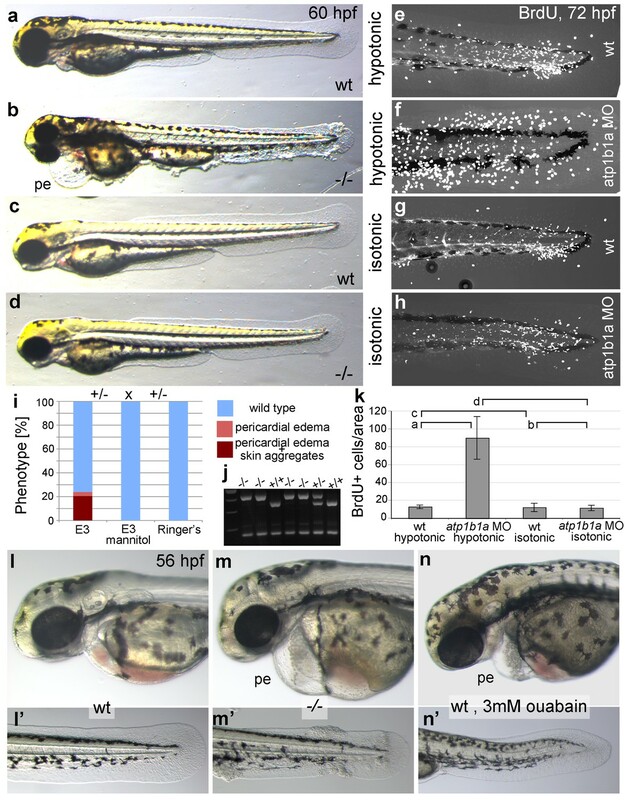 In zebrafish atp1b1a mutants, however, the NFκB-dependent increase in mmp9 expression only contributes to epidermal invasiveness, while epidermal hyperplasia is mediated by NFκB targets other than mmp9 (Figure 10m). Thus, in contrast to mmp9 knockdown, treatment of mutant embryos with hydroxyurea rescues epidermal hyperproliferation in the persistent presence of high NFκB activity. The nature of these proliferation-promoting NFκB targets remains unknown. CyclinD1 (ccnd1), a described direct transcriptional NFκB target in mammals(Hinz et al., 1999), seems an unlikely target, as its expression levels are unaltered in atp1b1a mutants (JH and MH, unpublished data). What also remains unknown is the player upstream of PI3K that is directly affected by hypotonicity and by the compromised epithelial polarity / adhesiveness of basal keratinocytes (Figure 10m). EGFR would be a strong candidate. It acts as the upstream regulator of PI3K to mediate hypotonic stress in human keratinocytes (Kippenberger et al., 2005), and is activated by hypotonicity in several other, MAPK-mediated responses (Lezama et al., 2005). Like Atp1b1a, EGFR is normally targeted to the basolateral side of epithelial cells (He et al., 2002), and its signaling strength is under the control of the epithelial polarity system (Hobert et al., 1999; Vermeer et al., 2003). Nevertheless, treatment of atp1b1a mutant embryos with the chemical pan-ErbB inhibitor PD168393 failed to rescue epidermal malignancies (JH and MH, unpublished data). This suggests that other receptor tyrosine kinases or their modifiers are the relevant players at the convergence point of hypotonic stress and aberrant epithelial polarity signaling. Na,K-ATPases and hypotonicity might also play a role during human carcinogenesis. Although not usually mentioned in this context (Martin-Belmonte and Perez-Moreno, 2012; Ellenbroek et al., 2012), one study has proposed the β1-subunit as a potential tumor-suppressor (Inge et al., 2008). This notion was based on functional analyses performed with virus-transformed MDCK cells, and the down-regulation of the β1-subunit in different human carcinoma cell lines (Espineda et al., 2004), and is strongly supported by our genetic in vivo data presented here. There are also several indirect lines of evidence for a tumor-promoting effect of hypotonic stress during human carcinogenesis. For instance, untransformed human keratinocytes display strongly increased proliferation when cultured in hypotonic medium (Gönczi et al., 2007). Systemic hypotonicity can also occur in humans in vivo. A major human condition that leads to systemic hypotonicity in conjunction with reduced Na levels (hypotonic or hypoosmolar hyponatremia) is increased nephric water re-absorption caused by ADH (antidiuretic hormone) hyperactivity. In SIADH (Syndrome of inappropriate antidiuretic hormone secretion), this is usually linked to carcinogenesis and results from ectopic ADH production by the tumors, which in general are rather aggressive (Ellison and Berl, 2007; Grohé and Berardi, 2015). In fact, hyponatremia is quite common in malignant solid tumors beyond SIADH (up to 25% of all patients). It is used as a prognostic and predictive value and is associated with high morbidity rates; its early diagnosis and treatment significantly improves the patients’ prognosis (Schutz et al., 2014; Grohé and Berardi, 2015; Balachandran et al., 2015). This correlation suggests that systemic hypotonicity / hyponatremia increases carcinoma incidence and aggressiveness. In addition, the carcinogenesis risk seems to be increased by locally restricted hypotonic stress. Such stress might occur, for instance, during injuries of the lung or the esophagus (Ribeiro et al., 1996; Islami et al., 2009; Goldkorn and Filosto, 2010; Maret-Ouda et al., 2016), when epithelial cells become exposed to the airway surface fluid (Joris and Quinton, 1993) or to saliva (Edgar, 1992), respectively, both of which are hypotonic compared to the internal milieu. In this light, and in light of the data presented in this work, it makes sense to include treatments that target osmotic conditions in therapies against certain carcinoma types (Balachandran et al., 2015; Grohé and Berardi, 2015). Furthermore, lavages with distilled water during cancer surgery (Iitaka et al., 2012), or hypotonic approaches to improve the uptake of chemotherapeutics by tumor cells (Stephen et al., 1990), should be used with caution. The mutant line psoriasism14 (Webb et al., 2008) and the transgenic lines Tg (Ola.Actb:Hsa.hras-egfp)vu119Tg (ubiquitous expression of membrane-tagged EGFP) (Cooper et al., 2005),Tg(krt4:GFP)gz7Tg (periderm-specific expression of GFP) (Gong et al., 2002), and Tg(NFκB-RE:eGFP)sh235Tg (NFκB responder) (Candel et al., 2014) have been described previously. The krt4:atp1b1a-gfp construct was generated using the Tol2 kit (Kwan et al., 2007) with the described krt4 promoter (Gong et al., 2002). The primers 5’- GGGGACAAGTTTGTACAAAAAAGCAGGCTCCACCATGCCCGCAAATAAAGATGG-3’ and 5’-GGGGACCACTTTGTACAAGAAAGCTGGGTATGACTTGGTTTTGATGGTGAAC-3’ were used to amplify the atp1b1a cDNA, which was cloned into pDONR221 (Invitrogen, Carlsbad, CA). The construct was used to generate the stable transgenic line Tg(krt4:atp1b1a-gfp)fr36Tg by standard injection and screening procedures. Genotyping of the psoriasis mutation was conducted by PCR with the primers 5’-TCCGAGAATCCAAAATGAGC-3’ and 5’-CACTCGTCTCCGTTTATTCG-3’ followed by an MwoI digestion of the PCR product. Embryos were raised in E3 medium (5 mM NaCl, 0.17 mM KCl, 0.33 mM CaCl2, 0.33 mM MgSO4; hypotonic), E3 medium containing 250 mM mannitol, or Ringer’s solution. All zebrafish experiments were approved by the national animal care committees (LANUV Nordrhein-Westfalen; 8.87–50.10.31.08.129; 84–02.04.2012.A251; City of Cologne; 576.1.36.6.3.01.10 Be) and the University of Cologne. Genomic DNA was extracted from a pool of 20 affected embryos and from their healthy parents using a Maxwell 16 instrument from Promega, according to the manufacturer's protocol. The DNAs underwent individual library preparation and enrichment (SureSelectXT Zebrafish Kit 5190–5450, Agilent Technologies, Santa Clara, CA), using 3ug DNA fragmented to 150bp by sonication (bioruptor, Diagenode, Liège, Belgium) and the standard protocol SureSelectXT Target Enrichment for Illumina Paired-End Multiplexed Sequencing. After validation (Agilent 2200 TapeStation) and quantification (Invitrogen Qubit System), we performed a qPCR by using the Peqlab KAPA Library Quantification Kit and the Applied Biosystems 7900HT Sequence Detection System (Applied Biosystems, Foster City, CA). Pools of 2–4 libraries were sequenced on one lane using an Illumina TruSeq PE Cluster Kit v3 and an Illumina TruSeq SBS Kit v3-HS on an Illumina HiSeq2000 sequencer with a paired-end (101x7x101 cycles) protocol. The alignment to the zebrafish reference version Zv9 was performed using the Burrows-Wheeler Aligner (BWA). PCR duplicate marking was performed using Picard, both realignment around indels and variant calling were performed using the Genome Analysis ToolKit (GATK). The annotation was performed using Annovar and the variations were filtered according to the predicted effect at the protein level and according to their presence in a control set of 5 unrelated zebrafish Whole-Exome Sequencing datasets. For mapping, all variant loci with a coverage of at least 20 were selected from both the affected pool and the parental DNA, with the exclusion of loci in which both datasets were homozygous for the variant allele. At every locus, the percentage of reads showing the variation in the parental DNA was subtracted from the percentage of reads showing the variation in the affected pool. The absolute value of this difference was then plotted against the physical position of the locus and heatmaps were generated for the whole genome and for each chromosome. The chromosomes were then visually analyzed to identify the regions in which the majority of the loci show a difference of either 25% or 50%. Embryos were fixed in 4% paraformaldehyde (PFA) and WISH was performed as previously described (Carney et al., 2007). DIG-labeled probes were synthesized with the Roche digoxygenin RNA synthesis kit, using cmlc2, mmp9 and mpx cDNA templates as described (Carney et al., 2007; Reischauer et al., 2009). For atp1b1a, a cDNA was amplified using the following primers 5’-ATGCCCGCAAATAAAGATGG-3’ and 5’-TCATGACTTGGTTTTGATGG-3’, cloned into pGEM T Easy (Promega) and linearized with SacII for Sp6 RNA pol-dependent antisense RNA synthesis. Combined colorimetric WISH and immunostainings were performed as described (Carney et al., 2007). Images were taken on a Axioplan2 microscope (Zeiss) using AxioVision software (Zeiss). 1.5 nl of 1 mg/ml rhodamine-dextran (Molecular Probes, Eugene, OR; D1816) in PBS was injected into the common cardinal vein of 34 hpf embryos anaesthetized with Tricaine. Injected embryos were incubated in E3 until 50 hpf, when remaining rhodamine-dextran was detected by confocal microscopy. Cryosections were generated as previously described (Westcot et al., 2015). For TEM analysis, embryos were anesthetized with Tricaine, heads were removed using a scalpel and subjected to genotyping, and tails were processed for ultrathin sectioning and TEM as described (Feitosa et al., 2011). To determine cell proliferation, embryos were incubated in 10mM BrdU in E3 for 1 or 2 hr, followed by a one-hour wash with E3 and fixation in 4% PFA. BrdU incorporation was detected by anti-BrdU immunolabelling. IF analyses were performed essentially as previously described (Carney et al., 2007). Embryos were fixed in 4% PFA for stainings using the following primary antibodies: mouse anti-Tjp1 (Zymed, San Francisco, CA; 33–9100, 1:200), mouse anti-chicken ATPa5 (Developmental Studies Hybridoma Bank; DSHB, 1:200), mouse anti-chicken ATPa6F (DSHB, 1:200), rabbit anti-Cdh1 (Anaspec, Fremont, CA; 1:200), mouse anti-Cdh1 (BD Biosciences, 610188, 1:200), rabbit anti-laminin (Sigma Aldrich, St. Louis, MO; L9393, 1:200), mouse anti-BrdU (Roche, Basel, CH; 1170376, 1∶100), mouse anti-collagen II (DSHB II-II6B3-c, 1:200), chicken anti-GFP (Invitrogen; A10262, 1:300), mouse anti-p63 BC4A4 (Zytomed, 1:200), rabbit anti-zebrafish Lgl2 (Sonawane et al., 2009) (1:400), rabbit anti-aPKC (C-20, Santa Cruz Biotechnologies, Dallas, TX; sc-216, 1:200), rabbit anti-phospho-S6 ribosomal protein (pS6RP, Ser240/241; Cell Signaling Technology, Danvers, MA; #2215, 1∶300). For stainings with the mouse anti-panKeratin1-8 (Progen Pharmaceuticals, Darra, Australia; 61006, 1:10), embryos were fixed with Dent’s fixative (80% Methanol, 20% DMSO, at -20°C overnight). For pAkt stainings, embryos were fixed in EAF (40% ethanol, 5% acetic acid, 4% formaldehyde in PBS) and either washed with PBS-TritonX, followed by an antigen retrieval in 10 mM Tris, 1 mM EDTA, pH 9.0 for 60 min at 60°C, blocking in 5% sheep serum and antibody incubation with rabbit anti-pAkt (S473) (Cell Signaling Technology #4060, 1:50) or processed for cryosectioning as described (Westcot et al., 2015). Secondary antibodies were anti-mouseCy3, anti-rabbitCy3, anti-mouseAlexa488, anti-mouseAlexa647, and anti-chickenAlexa488 (all Invitrogen, Carlsbad, CA; 1:200). 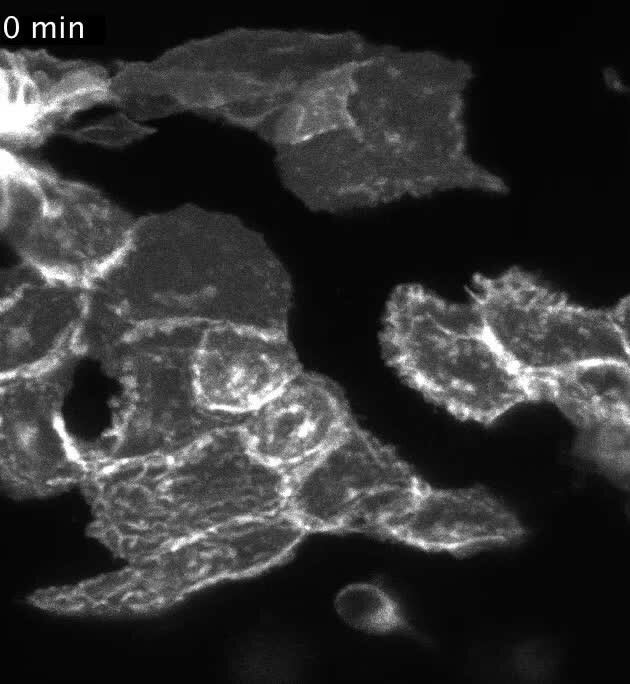 Images were taken using a Zeiss Confocal (LSM710 META) and processed using the ImageJ software. Ventral ectodermal cells from Tg(Ola.Actb:Hsa.hras-egfp)vu119 donor embryos either un-injected or injected with atp1b1a MO were transplanted into the ventral ectoderm of wild-type or atp1b1a morphant recipients at 6 hpf. Homotypic mosaics (wt to wt, morphant to morphant) embryos were raised in E3 medium until 48 hpf, mounted in 1.5% LMP agarose in E3, and clusters of GFP+ cells were recorded by time-lapse confocal microscopy (Figure 2A,B and Videos 1,2). Heterotypic chimeras (wt to morphant, morphant to wt) were raised in E3 250 mM mannitol until 84 hpf, fixed in Dent’s fixative and subjected to anti-GFP and cytokeratin IF (Figure 8a,b). Ouabain (Sigma-Aldrich; St. Louis, MO) and hydroxyurea (Merck, Kenilworth, NJ) were dissolved in water, Wortmannin (Sigma-Aldrich), PIK90 (Merck), LY294002 (TocrisBioscience, Bristol, UK), Rapamycin (Merck), AZD8055 (Santa Cruz Biotechnologies), and Withaferin A (TocrisBioscience) in DMSO, and solutions were further diluted in E3 embryo medium to concentrations of 3mM (ouabain), 50mM (hydroxyurea), 1 µM (Wortmannin), 5 µM (PIK90), 25 µM (LY294002), 1.1 µM (Rapamycin), 30 µM (AZD8055), and 30 µM (WithaferinA). Embryos were incubated in inhibitor solution starting from 34 hpf and scored at 54 hpf. Sequences and concentrations of antisense morpholino oligonucleotides (MOs) used. Quantitative experiments were repeated at least three times, reaching similar results. No outliers were encountered. Mean values and standard deviations of all individual specimens (biological samples; n) from one representative or all independent experiments are presented, as specified in the respective figure legends. Numbers of biological samples analyzed were decided on depending on obtained standard deviations and statistical significances. Quantifications of phenotypes were conducted by comparing treated and control progeny of the same parental fish. Fluorescence intensities were determined using ImageJ software. Significance of differences was determined using an unpaired two-tailed Student’s t-test, and obtained p values are mentioned in the respective figure legends. Numerical data from all quantitative analyses are also provided in the Supplement as a source data file. Data illustrated in representative images that are shown without statistical calculations were obtained from at least 15 out of 15 investigated specimens from at least three independent experiments. Journal of Molecular and Cellular Cardiology 47:552–560. Journal of Cellular Physiology 229:1346–1352. Journal of Cell Science 122:905–911. International Journal of Cancer 133:1784–1791. Results and Problems in Cell Differentiation 40:322–345. Seminars in Cancer Biology 22:208–215. The New England Journal of Medicine 356:2064–2072. Molecular Biology of the Cell 15:1364–1373. Methods in Cell Biology 105:191–222. Current Opinion in Nephrology and Hypertension 17:526–532. American Journal of Respiratory Cell and Molecular Biology 43:259–268. Critical Reviews in Oncology/hematology 96:1–8. The Journal of Biological Chemistry 277:38284–38293. American Journal of Physiology 288:F923–F929. Molecular and Cellular Biology 19:2690–2698. Journal of Cellular Physiology 181:330–341. The Journal of Surgical Research 176:524–534. International Journal of Cancer 125:491–524. American Review of Respiratory Disease 148:1633–1637. Trends in Cell Biology 21:401–408. American Journal of Physiology 290:C371–C378. The Journal of Cell Biology 171:1061–1071. Molecular Biology of the Cell 12:279–295. Journal of Biochemistry and Molecular Biology 40:88–94. The British Journal of Surgery 83:1174–1185. American Journal of Physiology. Cell Physiology 302:C1271–C1281. The Journal of Biological Chemistry 283:2192–2202. Thank you for submitting your work entitled "Tumor suppression in basal keratinocytes via dual non-cell-autonomous functions of a Na,K-ATPase β subunit" for consideration by eLife. Your article has been favorably evaluated by Fiona Watt (Senior editor) and three reviewers, one of whom is a member of our Board of Reviewing Editors. 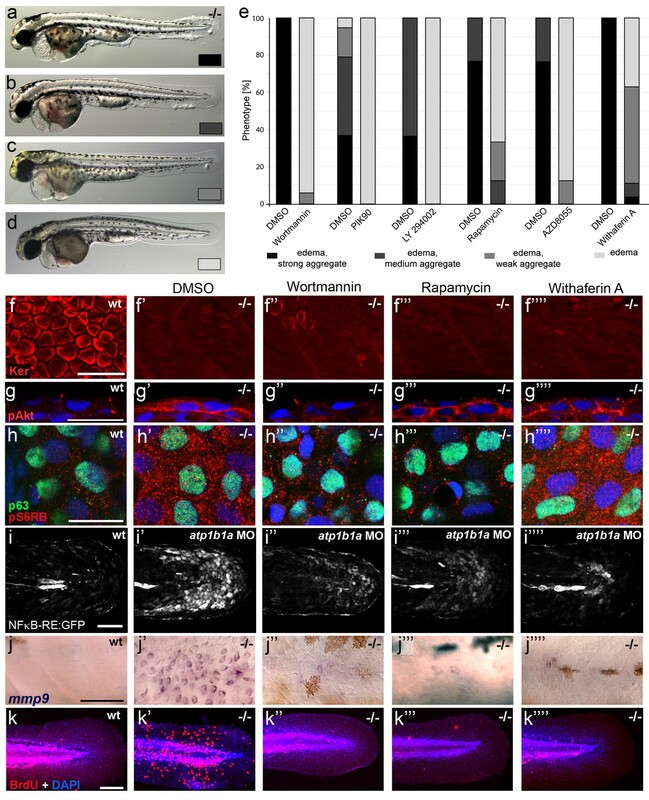 This paper deals with the study of uncontrolled basal cell proliferation in zebrafish, as a model to investigate carcinogenesis and tumor suppressors. The major conceptual advance of this paper is the claim that systemic isotonicity prevents malignant transformation, thereby identifying hypotonic stress as a new contributor to tumor development. Both points from reviewer 1. Points #2 (using MO's for example) and #6 from reviewer 2. Addressing point #1 from reviewer 2 (through mosaic analysis for example) would be a terrific addition to the paper, and points #2 and 5 can be taken care of by appropriate changes in the text. This paper from the Hammerschmidt lab deals with the study of uncontrolled basal cell proliferation in zebrafish, as a model to investigate carcinogenesis and tumor suppressors. The major conceptual advance of this interesting paper is the claim that systemic isotonicity prevents malignant transformation, thereby identifying hypotonic stress as a new contributor to tumor development. 1) The evidence that the psoriasis phenotype is caused by a loss-of-function mutation in the atp1b1a gene is fairly convincing but the following data should be added to the supplementary information: map showing 10-20 genes on each side of atp1b1a as well as a list of any other genes in this region that were sequenced to identify molecular lesions. 2) In order to tighten the text, it might make sense to move the negative data to the supplementary material (e.g., panels 10c-f; panels 5b-c could also be moved). As it stands, the paper is very long winded. The manuscript entitled "Tumor suppression in basal keratinocytes via dual non-cell-autonomous functions of a Na,K-ATPase β subunit" by Hatzold et al. reports the importance of atp1b1a function in prevention of malignancy in the zebrafish epidermis. The authors propose that perturbed cell adhesion, cell polarity in the epidermis and osmotic stress caused due to impaired function of heart and larval kidney contribute towards the development of malignancy. 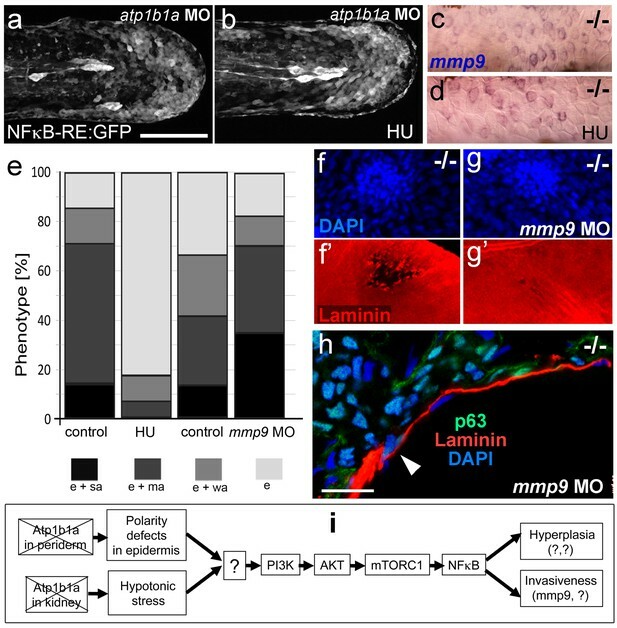 They further show that the osmotic stress results in activation of PI3K-AKT-mTORC1- NFκB-MMP9 pathway in the basal epidermis promoting cell proliferation as well as invasive behavior of the cells. These findings are conceptually interesting and bring into light the importance of osmotic stress in development of malignancy. Following concerns need to be addressed to improve the analyses and to substantiate the authors' claims. 1) EMT is one of the major hallmarks of Malignancy. The authors should perform live imaging of the basal cells to show EMT in the psoriasis mutant. 2) The basic premise of this paper is that the loss of cell polarity and adhesion in the periderm secondarily affect the adhesion and polarity in the basal epidermis in psoriasis mutant. These perturbations in cell polarity and adhesion in conjunction with the osmotic stress results in malignant behavior of the basal epidermal cells. If correct, driving expression of atp1b1a in the periderm should rescue all the aspects of cell polarity phenotype in the periderm as well as in the basal epidermis and also rescue malignancy in the basal epidermis without affecting the edema phenotype (as the kidney and heart will remain nonfunctional) in hypotonic medium. Authors have just looked at the keratin localization upon driving the expression of atp1b1a in the periderm, that too in the isotonic condition, which is not enough. 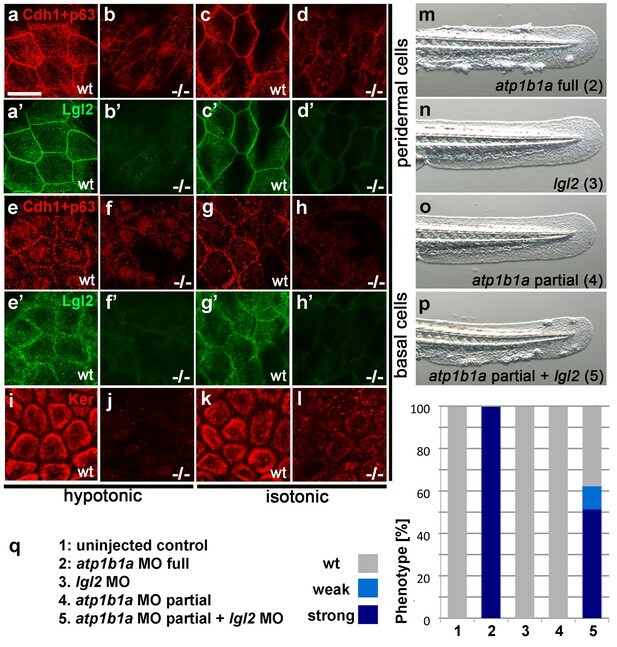 These rescue experiments are crucial for this paper and can be easily done using their transgenic line that drives expression of atp1b1a-gfp in periderm under keratin4 promoter. 3) Authors suggest that the decrease in heart-beats and lowering the blood pressure affects kidney function and leads to edema formation. This is far-fetched in the absence of any solid evidence. It is equally possible that the effect on polarity of kidney epithelial cells results in edema development, which further decreases the heart function. 4) There is a considerable decrease in Lgl2 localisation in the psoriasis mutant epidermis. This result indicates that Lgl2 localisation requires atp1b1a function in the periderm (possibly directly) as well as in the basal epidermis (indirectly?) whereas the interaction studies indicate that atp1b1a and lgl2 have partial redundant functions. Previous studies (Reischauer et al., Westcot et al.) suggest that Lgl has a pro basal function in the basal cells of the developing fin epithelium and that it's loss is enough to cause hyperplasia and EMT. Therefore, it is difficult to interpret the genetic interaction data that authors have. Is it possible that the decrease in Lgl levels contributes to the malignancy phenotype in psoriasis mutant? If yes, can authors rescue the aspects of malignancy by restoring the Lgl levels in psoriasis mutants? Is it that the reduction in Lgl and ATP1b1a levels in the periderm results in malignant phenotypes when morpholinos are coinjected at suboptimal concentrations? Or is it that the reduction in Lgl levels in the basal epidermis and reduction of Atp1b1a in the periderm results in the malignant phenotype when authors co-inject the morpholinos at sub optimal concentrations? What is the status of edema in the larvae injected with the suboptimal concentration of both the morpholinos? Is it the same PI3K-AKT-mTORC1- NFκB-MMP9 pathway that gets activated in the co-injected embryos? In its current form the genetic interaction data does not contribute much towards our understanding of how these two components actually interact and function together in stratified epithelium. If authors wish to include these data in the manuscript a thorough analysis of this part (addressing questions raised above) is required. 5) The malignant phenotypes are mainly observed in the fins. Are the polarity phenotypes present throughout the epidermis? If yes, how do the authors explain the prevalence of the malignant phenotype in the fin? The expression analysis indicates that atp1b1a is expressed mostly in the flank and in the fins. Is this the reason for stronger phenotypes in the fin? In general it will be good if authors mention in the main text where the localization analysis is performed for polarity or adhesion components. 6) The rescue experiments using inhibitors of signaling pathway components (NFkB, mTOR etc) should be accompanied by BrdU analysis. Since authors argue that these components act in a linear pathway, it is essential to show that inhibition of PI3K restores the pAKT levels in the mutant whereas treatment with Rapamycin and NFkB inhibitor does not reduce the pAKT levels. In addition, a readout for mTOR signaling (phospho S6K) can be used to place mTOR in between PI3K and NFkB. Since the effect of rapamycin treatment is weaker as compared to the other inhibitors, the number of experimental animals for rapamycin treatment may be increased. The number (n=31) is low, possibly with 9 mutant animals of which 4 do show weak aggregates in the mutant. It would be useful if authors describe the criterion for weak and strong phenotypes. This work describes the very interesting finding that mutation of a Na,K-ATPase regulatory subunit causes in vivo epidermal malignancy by a novel mechanism. The work starts out with a very interesting zebrafish mutant called psoriasis that had previously not been genetically identified (despite much effort), but is identified here with the advent of whole exome sequencing, and found, surprisingly to be the protein mentioned above. This is surprising since one of the hallmarks of psoriasis is the overgrowth of the epidermal cells and an ATPase would not seem an obvious candidate to be a tumor suppressor. With the key gene identified, the authors then go on to do a set of very interesting experiments, including showing the very unexpected result that changing the hypotonicity of the growth media inhibits the epidermal growths, revealing a non-autonomous osmoregulatory role of the Na,K-ATPase in these tumors. In addition, they also show that the overgrowth effects on the basal epidermal cells is due to effects in the overlying periderm, again showing a surprising non-autonomous effect. Finally, they also provide molecular details, connecting these changes to the Akt/NFkB pathway. This work provides some very interesting findings and shows very nicely how the fish system can be used to figure out complex oncological pathways, and to discover how they are regulated in the whole animal, not just within the tumor per se. This will be of interest to a wide range of readers. There is a large amount of work, and the writing is very clear. I fully support publication. Points #1 and #2 of Reviewer 1 have both been addressed as requested, the figures have been reorganized accordingly, and the requested additional information is now provided. In addition, we now provide all additional data requested in points #1, 2 and 6 of Reviewer 2. Furthermore, although not demanded by the Reviewing Editor, we have also carried out some of the experiments proposed by Reviewer 2 in point #4 and provide more data elucidating the cooperation between Atp1b1a and Lgl2. Furthermore, we have re-worded and extended our description and discussion of the role of Atp1b1a in heart and kidney, as requested by Reviewer 2 in point 3, and have clarified the topology of epidermal defects in atp1b1a mutants, as questioned by Reviewer 2 in point 5. We now show the requested map as well as a table with 22/20 genes on each side of atp1b1a, and an indication of the interval to which atp1b1a had been meiotically mapped by Webb et al., 2008 (Figure 3—figure supplements 1 and 2). In the legends of these supplementary figures, as well as in the main text (subsection “The psoriasis phenotype is caused by a loss-of-function mutation in atp1b1a encoding a Na,K-ATPase β-subunit”, first paragraph), we also state that we sequenced the exons of all of these annotated genes. However, apart from the described non-sense mutation in atp1b1a, no further mutagenic lesions were identified. We have removed the suggested panels to the Supplement, as well as multiple panels showing representative live images of embryos from additional figures, while just leaving the graphs with the quantifications in the main figures. In addition, to streamline the results on the PI3K-AKT-mTORC1-NFkB, which indeed were long winded, we re-organized former Figures 8 and 9 to one, more systematically structured Figure, in which even more data were integrated, as requested by Reviewer #2 (new Figure 9). Time-lapse live imaging of clones of mGFP-labeled basal kerationcytes of homotypically mosaic control and atp1b1a morphant embryos were generated, starting at 48 hpf and outside epidermal aggregates. Two representative videos are now supplied as supplemental material, and stills of these two videos are shown as new Figure 2A, B. In comparison to wild-type cells, which are very static, atp1b1a morphant cells are much more dynamic, with protrusive activity and ongoing dissociation and re-association with neighboring cells. These results are now described in the second paragraph of the subsection “psoriasis mutant embryos display characteristics of epidermal malignancy”. We name this behavior a “partial EMT”, similar to what we have formerly observed for morphants lacking the Matriptase inhibitor Hai1a (Carney et al., 2007). The reason for having performed the experiments in isotonic medium was to eliminate any effects possibly caused by the systemic hypotonicity, rather than the loss of atp1b1a in the periderm. Nevertheless, we have now also incorporated the requested studies of Tg(krt4:atp1b1a-gfp)–containing mutants kept in hypotonic medium (additions to Figure 8 and new Figure 8—figure supplement 1). Both for epidermal morphology/aggregate formation (Figure 8—figure supplement 1B, C), as well as for the malignancy markers pAKT (Figure 8F-H) and mmp9 (Figure 8—figure supplement 1G, K, O), we obtained a significant, yet incomplete restoration to wild-type conditions, whereas edema remained unaffected (see Figure 8—figure supplement 1A for the quantification of epidermal aggregate and edema formation; in addition, for the different stainings, results similar to the shown representatives were obtained for at least 15 out of 15 investigated specimen from at least three independent experiments; subsection “Statistics”). Of note, a similar partial restoration as for the malignancy markers was obtained for the cell polarity markers Lgl2 in the periderm (Figure 8—figure supplement 1E, I, M) and cytokeratin in the basal layer (Figure 8—figure supplement 1B, C). In conclusion, while further supporting the notion that Atp1b1a from the periderm promotes epithelial polarity and suppresses malignancy in basal keratinocytes, the data further indicate that the degrees of polarity defects and epidermal malignancy are proportionally linked. In addition, they suggest that hypotonic stress further challenges the epithelial cell polarity system, which therefore is more difficult to repair by transgene-encoded Atp1b1a from the periderm than under isotonic conditions. In the text of the manuscript, these new data are described and discussed in the last paragraph of the subsection “atp1b1a interacts with lgl2 and is required in peridermal cells to establish proper epithelial organization of basal keratinocytes”. We never meant to claim this and actually don’t think we did. But, we have re-written the corresponding paragraphs in the Results (subsection “atp1b1a is required for proper heart and pronephric function”) and Discussion (subsection “The role of Atp1b1a in kidney and heart to avoid systemic hypotonicty”) to point out more clearly the direct effects of loss of Atp1b1a function in pronephric epithelial cells as the likely primary cause of aberrant osmoregulation. In the Discussion, we also mention that in addition to the mislocalization of the pump’s α subunit, epithelial polarity of renal epithelial cells might be generally compromised. In general, we agree with the Reviewing Editor (who did not mark this point as an essential revision) that these proposed experiments, although interesting, are beyond the scope of this manuscript, as its main focus is on the tumor-suppressive role of ATP1b1a, and not on it’s the mechanisms underlying its cooperation with Lgl2. The main reason to show the genetic interaction between the two was the desire to provide a further line of evidence that ATP1b1a regulates epithelial cell polarity of epidermal cells. Therefore, we very much prefer to leave these interaction data in the manuscript, in particular, as we now have added at least some (in our opinion the most crucial) of the proposed new experiments. Thus, we now show that embryos co-injected with sub-phenotypic doses of atp1b1a and lgl2 MOs also display edema formation and a down-regulation of Na/K-ATPase α-subunits in basolateral domains of pronephric epithelial cells, as well as an up-regulation of pAKT levels and mmp9 expression in basal keratinocytes. Moreover, we show that the epidermal aggregates, but not the edema, are rescued upon treatment with the chemical PI3K, mTORC1 and NFkB inhibitors (new Figure 7—figure supplement 1). We conclude that ATP1b1a and Lgl2 most likely cooperate both in the epidermis (periderm) and in the pronephros to suppress epidermal malignancy. 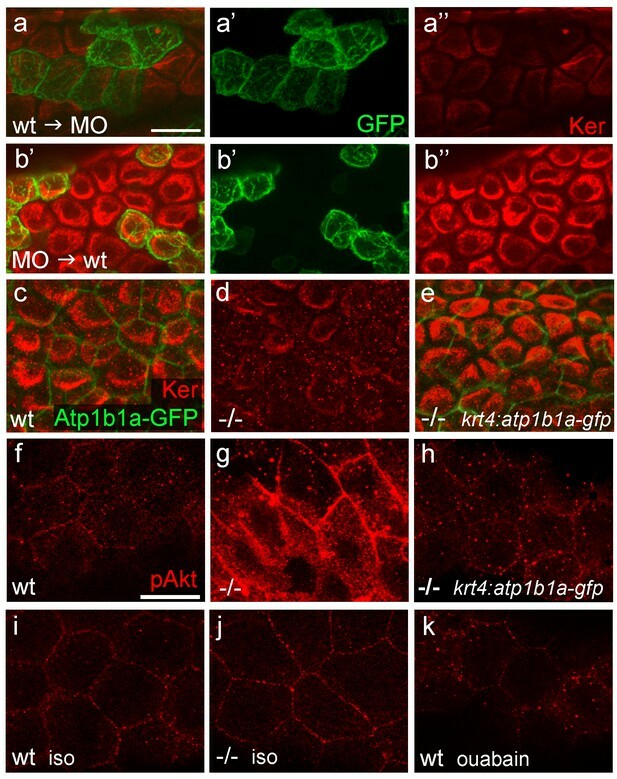 These new findings are now described and discussed in the first paragraph of the subsection “atp1b1a interacts with lgl2 and is required in peridermal cells to establish proper epithelial organization of basal keratinocytes”, and in the subsection “The cooperation between Atp1b1a and Lgl2”. We now show that the malignant phenotypes (epidermal aggregates) also occur on the flank, the yolk sac, and the head of the mutant embryos, so basically everywhere (new Figure 1E-G). Generally, for our molecular analyses of polarity and malignancy markers, we tried to avoid regions within epidermal aggregates, as the altered spatial organization of the epidermis in these aggregates makes it very difficult to image the molecular alterations at higher magnifications. However, the same molecular alterations were seen within aggregates and in inter-aggregate regions, independent of their position on median fins, flank, yolk sac or head. Anyway, we now state in the figure legends where the images were taken. 6) The rescue experiments using inhibitors of signaling pathway components (NFkB, mTOR etc) should be accompanied by BrdU analysis. BrdU incorporation analyses have been added to the more systematically structured new Figure 9 (panels K-K’’’’). Since authors argue that these components act in a linear pathway, it is essential to show that inhibition of PI3K restores the pAKT levels in the mutant whereas treatment with Rapamycin and NFkB inhibitor does not reduce the pAKT levels. We had already shown in the last version of the manuscript that pAKT levels were restored by wortmannin (reduced), whereas they remained high after Whitaferin-A treatment. We have now added the corresponding data for Rapamycin-treated mutants (pAKT levels remain high) and show them next to each other in the newly structured Figure 9 (panels G-G’’’’). In addition, a readout for mTOR signaling (phospho S6K) can be used to place mTOR in between PI3K and NFkB. We now show immunofluorescence analyses with a pS6RP antibody formerly used in zebrafish as a readout of mTORC1 signaling, demonstrating that it is strongly up-regulated in psoriasis mutants compared to wild-type siblings, and down-regulated again to wild-type levels upon treatment with Wortmannin and Rapamycin, but not upon treatment with Withaferin A, in line with the proposed linearity of the pathway (Figure 9H-H’’’’). We thank Heike Wessendorf for excellent technical assistance; David Kimelman, Gilbert Weidinger, Steve Renshaw, Zhiyuan Gong and Jacek Topczewski for zebrafish lines; and Mahendra Sonawane for the Lgl2 antibody. Work in the laboratory of MH was supported by the German Research Foundation (DFG; SFB 829 and its Z2 project), the European Union (Seventh Framework Programme, Integrated Project ZF-HEALTH, EC Grant Agreement HEALTH-F4-2010-242048) and the US National Institute of General Medical Sciences (GM63904). Animal experimentation: All zebrafish experiments were approved by the national animal care committees (LANUV Nordrhein-Westfalen; 8.87-50.10.31.08.129; 84-02.04.2012.A251; City of Cologne; 576.1.36.6.3.01.10 Be) and the University of Cologne. © 2016, Hatzold et al. Research on zebrafish reveals how a tumor suppressor works in two different types of cells, and how hypotonic stress promotes tumor formation when the function of this tumor suppressor is lost.